I am probably the only person to have ever put on weight travelling round India. Our itinerary was planned round historic monuments and the best or most unusual restaurants listed in the guidebooks. I have also carried a foot-long Hungarian salami from London to Venice by train- but that's another story. All good experience for my recent work for the Sunday Times Food List, researching local and affordable restaurants in the East, North West, Yorkshire and Wales, and for interviewing Living Ventures for the Sunday Times 100 Best Companies to work for list. Here you can read all my food and travel-related articles, including my early restaurant reviews. The Sunday Times 100 Best Companies List 2013: 9: Living Ventures (Restaurant chain), The Sunday Times, March 2013. The training at this successful restaurant company and bar operator based in Knutsford, with restaurants in Manchester, London and across the northwest, is intensive. Each member of staff is expected to learn the company ethos, which includes concepts such as “small world”, “ticket to ride” and “the bubble bath dilemma,” verbatim. Liz Sear, now an assistant general manager at the Grill on the Alley in Manchester, underwent the management training scheme after graduating from Leeds University four years ago. She spent a year studying every aspect of the business, with four months each in the bar, kitchen and on the floor. Sear needed to be able to cook every dish on the menu. “I have to know exactly what ingredient goes into every dish,” she says. In an emergency, she explains, she could take over the role of chef. When Sear took her current job, the company told her: “Your next move is general manager.” It meant she could see a clear path ahead. Staff believe that the job is of great personal benefit (an 81% positive score and a top five ranking). They also feel it is good for their own personal growth (83%) and that there are unlimited opportunities to learn and grow within the organisation (74%). Their boss, Tim Bacon, managing director and co-founder, began as a bartender for TGI Friday’s, a fellow Best Company to Work For. Bacon likes to “hire hard, fire easy”, and has high standards for those he employs. “Never employ someone you wouldn’t go for a drink with,” he says. One current operations manager started as a waitress Bacon poached from a rival company. How? “We offered her a future, with a winning smile,” he laughs. Besides excellent training, Living Ventures pays well. Servers have such a good deal that Coldbeck was happy to leave his previous job as a manager to start as a waiter at the company’s Gusto restaurant on Liverpool’s Albert Dock. “The money is so good as a server,” he says. Although the average wage for servers is £17,000, the restaurants are always busy, so when you add the generous tips, it becomes a very attractive proposition. Staff feel they are paid fairly for the work they do, in comparison to others within the company (72%), as well as elsewhere in the industry (70%). Coldbeck enjoys the flexible aspect of his work, which has allowed him to travel the world. His co-workers feel that they receive fair pay for the responsibilities they undertake (70%), and the perks include employees and their guests being able to dine for half price in all Living Ventures eateries. Colleagues feel a strong sense of family within their teams (83%). Coldbeck agress that “the teams are very tight” and comments that staff retention is impressive for the industry, adding that Living Ventures is “very good at bringing people on board who care, and do things right”. In 1755 Dr Samuel Johnson’s dictionary defined ‘oats’ as "a grain which in England is generally given to horses, but in Scotland supports the people". Thus the English suspicion of Scottish eating habits has been ingrained for as long as oats have been oats. 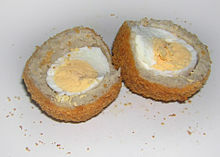 Haggis aside, there is one Scottish culinary invention that I cannot fault: the Scotch Egg. Recently taking a dive in status when Keith (the fat one) from the Office announced it was his favourite snack, it was brought still lower when Ricky Gevais defined it as a form of cruelty to birds: “ The farmer comes along, boils her (the female chicken’s) babies in hot water…and then you pop the dead baby in some sausage meat and deep fry that to make sure that little baby bird will never come back to life. And then you eat it.” Nonetheless it is a picnic classic, a satisfying protein double whammy- sausage and egg, a great combination. Consenus says they’re best homemade. According to my MSN eggspert correspondent this sis quite simple- boil eggs, roll them in sausage meat, baste with egg yolk, roll in breadcrumbs, bake. He tells me “you can buy sausage meat in outrageously phallic portions of plastic covered ...well, sausages I guess”. In the absence of time and energy, there is always Marks and Spencer. You may well be confused on gazing at the shelf however, as next to the 2 pack Scotch eggs, you will find a 4 pack of ‘picnic eggs’. These look smaller, yet identical. Do not be fooled. What M&S label as ‘picnic egg’ actually contains not a whole boiled egg beneath its bread-crumbed sausage exterior, but chopped egg. While not a genuine Scotch egg, this delicacy is also to be savoured. Eat: Hadjuczek Cherwell, 6 February 2004, p. 8. 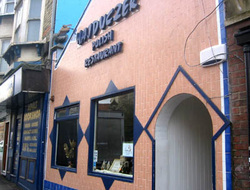 Oxford finest Polish restaurant, c.2004. Hajduczek is Oxford's first, best, and as yet, only Polish restaurant. * Its website claims it to be, "the place to bring your loved one, business colleague and friends to impress the delight of Polish cuisine, and meal is not complete without a national drink - Vodka or specialty Mead." The selection of vodkas is really impressive, ranging from Famous Bison vodka with grass to Orange Kosher vodka. But while the food is certainly delightful enough to be shared with loved ones, the lighting is not romantic, forcing you to gaze at them fully illuminated by harsh spotlights. The real reason to venture just past Nando's on the Cowley road is the food, served in generous portions, and quite unlike anything you will find elsewhere in town. We chose the Specjalnosc Hajduczka. After a creamy vegetable soup, we were served a huge platter comprising four traditional dishes: The Bigos, or Hunter stew, was described in the menu as "a precious jewel in the treasury of the Polish kitchen", but this sauerkraut and meat concoction was only one jewel in the crown. The Placki (potato pancakes) were perfectly crisp and golden, the Pierogi (ravioli) were large and creamy, and the Golabki (poached cabbage leaf) was full to bursting with mince and rice. Feeling just as stuffed as the Golabki, we soldiered on with dessert. Our gusto was revived when we were presented with poppy seedcake and cheese pancakes, both garnished with cream, fresh strawberries and grapes. The coffee was also of exceptionally high quality. In the current cold climate, Hajduczek's hearty hospitality is a welcome source of warmth. The tinny "Polish" music (sometimes they have live music from 8-10pm, call for information) and eclectic décor add to its charm. The overall effect is unpretentious and irresistible. Eat there. *84 Cowley Road is now a Russian restaurant called Arbat. Eat: French Bistros, Cherwell, 23 January 2004, p. 8. Do you remember Ma Belle? The cosy French place tucked away in a corner of Blue Boar St., opposite the Bear? Well, it’s gone. Sometime over the summer it was usurped by the young pretender Bistro Je T’Aime. Je n’aime pas Bistro Je T’Aime. The old black and white Tudor interior has been repainted a brash series of neon citrus colours that are, I suppose, meant to evoke the Mediterranean. I found they merely induced a headache. Having been painfully embarrassed by my father’s behaviour in various eating establishments, I may have inherited some of his characteristics. While this can be unpleasant for my eating companions, my readers should benefit from these inherited high critical standards. Owing to his outbursts, various restaurants that the family thitherto liked were blacklisted. His pet hate is slow or sloppy service. Admittedly, my faculties may have been over critical on the day I went to Bistro Je T’Aime- my boyfriend had coaxed me out for a lunchbreak mid-essay crisis. Having to fetch my own butter did not improve the situation! Saying that I can’t quite remember what I had to eat there is pretty insulting to the chef, as I can lovingly recall good meals I had over two years ago. Bistro Je T’Aime should not be displaying such upmarket prices on laminated card menus. Neither should it be serving, from what I remember, dry fish. It has trodden the mantle of Ma Belle into the mud. If you want a decent French-bistro type meal in Oxford, you would do much better at Pierre Victoire, Little Clarendon St. Its fresh, airy interior and solid wooden tables are much more likely to soothe a headache, especially when combined with the jazzy music they play, and , of course, the lovely food. For good salads and steak frites, go there. Its lunch menus are particularly good value, especially if you don’t bother with wine, and have an ice cream cone from G&D’s across the road for the walk back into town. For the serious carnivore, I would recommend The Mitre on the high street; it’s ideal for a decent steak.